Think of Deuter's ACT 24 Trail as a well-executed example of traditional backpack design. You don't get anything anything particularly cutting-edge here, but what you do get is functional and well-built. 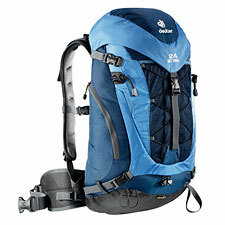 The 24-liter ACT Trail sits right in the middle of the day pack spectrum, both in terms of volume and also weight. You can drop an ounce or two by tossing the included rain cover, but that still leaves the Deuter at a beefy two pounds, ten ounces. The ACT Trail makes good use of its weight, however, in the form of a very comfortable suspension and well-padded waist and shoulder straps. The back panel employs mesh-covered padding that creates a bit of an air space against your back for ventilation. You also get a variety of small details that prove unexpectedly useful in the field, including a large universal helmet/gear mesh pocket, a clever side zip pocket, and quick zip access to the pack's main compartment—nothing groundbreaking, but all very useful. The ACT 24 does has an interesting, flexible, U-shaped frame rod (not removable), which provides a surprisingly amount of support, making the ACT 24 legitimately load-worthy for carrying up to twenty pounds or so. Certainly working in the pack's favor in this regard are the thick and padded straps, which do an excellent job of distributing the load without creating hot spots. Additionally, side and vertical load-balancing straps let you fine-tune the pack to your heart's content. That said, the ACT 24 does not have an expansion collar, so you are limited to the interior volume plus whatever you can strap to the outside. Also, the configuration of the compression straps is not well-suited for A-frame ski carrying. Realistically, unless you tend to carry gear that is both heavy and compact, the ACT 24's suspension is a bit overbuilt for a pack in this size range. Perhaps the strongest argument in the ACT 24's favor is that it just works. This is a rugged, fully-featured backpack that doesn't ask you to get used to anything unusual, or make any compromises. If the design feels a little retro (and a little heavy) it is nonetheless built to perfection, with all the features you expect and nothing experimental to gripe about. For general backpacking needs, call it a triumph of traditional design.